More than 70 people have been arrested in Moscow after activists tried to hold the city's first gay rights rally, despite a ban on the event. About 50 gay rights supporters were held, as well as 20 people from religious and nationalist groups opposed to the march. On Friday, a court upheld a ban on the march imposed by the city authorities who argued it could trigger violence. Saturday marks 13 years since Russia's decriminalisation of homosexuality. A number of foreign activists are in Moscow for a forum on gay rights. About 1,000 riot police were deployed close to Red Square in the heart of the city to stop the rally from taking place and prevent clashes with its opponents. They moved in when a group of activists tried to lay flowers at the Tomb of the Unknown Soldier, in a symbolic protest to equate the struggle for gay rights with the struggle against fascism in World War II. The rally's organiser, Nikolay Alexeyev, was among those arrested. Meanwhile demonstrators representing nationalist and Orthodox Christian groups chanted anti-gay slogans and shouted abuse. Eyewitnesses said several foreign gay rights activists were beaten by protesters. "What happened today unfortunately is representative of the non-respect for human rights in Russia. You can't express your point of view, and you are not protected from extremists," said French activist Sebastien Maria. Nationalist groups expressed anger at the nature of the action at the tomb. "We are Russians. We are Orthodox. These soldiers died so we could live like Russians, not so these people could come here and tell us what to do," Andrey, 25, told Reuters news agency. Both groups moved up one of the main city streets to a square outside the Moscow city government offices, where more arrests followed. Moscow Mayor Yuri Luzhkov said he had banned the march because he believed homosexuality was not natural and because the event would cause outrage in society - a position supported by many Christian and Muslim groups. He said that as long as he was mayor he would not allow such events to take place. Mr Alexeyev said the march would not go ahead as originally planned, but promised a public action nonetheless. 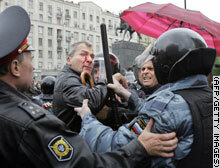 Russian police arrest German MP Volker Beck, who had been beaten by opponents of the gay rights rally. Police detain a nationalist protester outside Mayor Yuri Luzhkov's office in central Moscow. 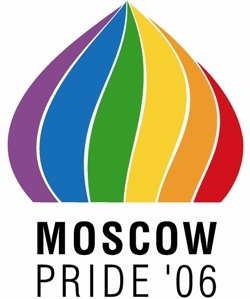 MOSCOW, Russia -- Police and nationalist protesters forcefully prevented Russian and foreign gay and lesbian rights activists from rallying in Moscow, where they had hoped to put on a display of gay pride despite the city government's vehement refusal to grant permission for a parade. "We are conducting a peaceful action. We want to show that we have the same rights as other citizens," the main organizer Nikolai Alexeyev told a news conference a few hours before the rally was to have begun. Activists had urged gay rights supporters to lay flowers at the Tomb of the Unknown Soldier, just outside the Kremlin wall, and then to gather in a square opposite Mayor Yuri Luzhkov's office. But police had closed the entrance to the garden where the tomb is located, and as the first half-dozen activists arrived carrying flowers, they were set upon by about 100 religious and nationalist extremists dressed in black who kicked and punched them. "Moscow is not Sodom!" they shouted. Women wearing head scarves held up religious icons while men in Cossack dress -- white sheepskin hats and black-and-red tunics -- stood by. "We were expecting this. It's the authorities that are allowing this to happen," said a woman holding a limp red carnation who identified herself as Anna, a lesbian. 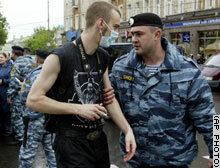 Riot police rushed in to separate the assailants from the gays but detained Alexeyev "as the ringleader," said British gay rights activist Peter Tatchell, who was in the group. Police said later they had detained 120 anti-gay protesters and gay activists. "Both the authorities and the fascists had the same objective -- to suppress the Moscow gay pride," Tatchell told The Associated Press. Shortly before the rally was to have begun, scores of apparently nationalist youths raced toward the site, waving and throwing flares into Moscow's main avenue, Tverskaya. By the start time of the rally, more than 100 youths were standing in the square opposite the mayor's office, chanting: "Glory to Russia!" "I came here to stop the gay parade. The authorities didn't allow them and they came here anyway," said a 22-year-old nationalist wearing a clinical face-mask -- apparently to guard his identity -- who gave his name only as Oleg. Police tried to clear the square but more showed up. Several trampled on a rainbow-colored ribbon -- a symbol of gay rights -- into the ground. "This is a perverts' parade," said one protester holding an icon of the Madonna, a woman who gave only her first name, Irina. "This is filth, which is forbidden by God. We have to cleanse the world of this filth." As a Green member of Germany's Bundestag, Volker Beck, was giving an interview before TV cameras, about 20 nationalist youths surrounded him and pummeled him, bloodying his nose. Volker Eichler, a gay activist from Berlin who witnessed the beating, said police did not intervene. "What happened today unfortunately is representative of the non-respect for human rights in Russia. You can't express your point of view, and you are not protected from extremists," said French gay activist Sebastien Maria. Saturday is the 13th anniversary of the decriminalization of homosexuality in Russia, and a number of foreign activists traveled to Moscow this week for an unprecedented forum on gay rights in Russia. City authorities cited the potential for violence as the primary reason for banning the parade. But they also voiced disproval of the very idea of gay rights. Luzhkov, the mayor, said in a radio interview Friday that gay parades "may be acceptable for some kind of progressive, in some sense, countries in the West, but it is absolutely unacceptable for Moscow, for Russia." "As long as I am mayor, we will not permit these parades to be conducted," he said. The issue has split Moscow's gay community, many of whom say that Russian society is still too conservative and that a parade would only provoke more violence from skinheads and radical groups. Approximately 5-8 percent of Russia's 143 million-strong population is gay and lesbian, according to gay rights activists.